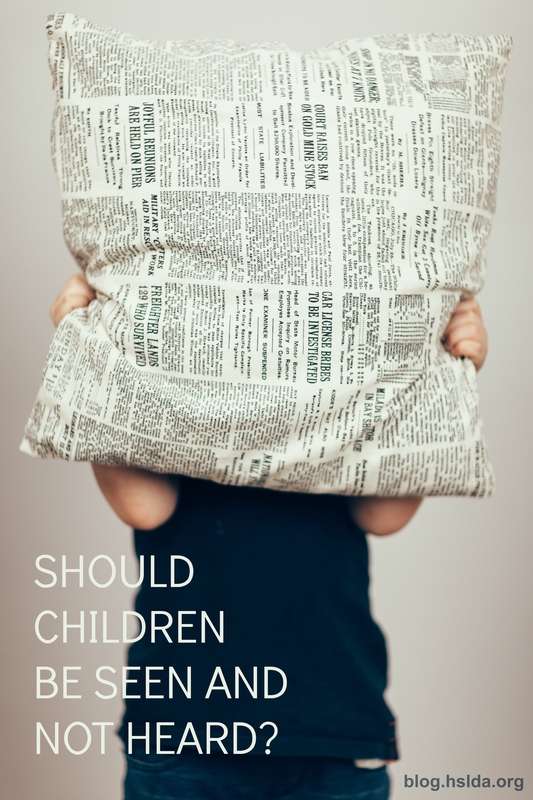 You are here: Home » Should Children be Seen and Not Heard? Growing up, I was often told “Children should be seen and not heard.” My gregarious personality demonstrated itself in talking at inappropriate times and inappropriate places when I was younger. Over time, I developed the manners that rested on my shoulders as an expectation of a child in my generation. My parents would drag me and my brother to long meetings or dinners and expect us to sit politely and not interrupt, which we found torturous. We were not to talk and were often expected to sit in a separate room with nothing to do but instigate each other. When my children were young, we had the touching rule. If my children approached me while I was speaking with someone else, they were to put their hand on me. If I was standing, this might be on my leg or sitting, on my shoulder. This touch let me know that they had something to say to me. It didn’t always play out perfectly, but often it gave them a polite way to get my attention, without interrupting the flow of conversation. This felt like it respected that my children were people, but helped them learn to navigate social mores. It was definitely a progression from the mindset that children were invisible. As a young homeschooling mom, I was mentored through the writings Charlotte Mason. She said “Children are born persons.” To ignore my children as if they didn’t exist in a room never felt like an authentic acknowledgement of their personhood. Knowing what it was like as a child with unacknowledged thoughts and feelings, led me into adulthood with a lot of difficulty expressing myself. Though I have always been someone who enjoyed words and putting them together to create a beautiful expression, I struggled not with how to communicate, but with knowing that what I had to say mattered. Parenting my own children, I struggled with finding the right balance of helping my children respect certain social expectations and honoring their thoughts and feelings. While enjoying uninterrupted conversation, I tried to remember that this time in their lives when they needed my attention to affirm their personhood was so temporary. Though done poorly at times, I always tried to balance teaching my children manners while validating their thoughts and feelings and by doing so, making them aware that they were important, even if only to me. We homeschooled all 5 of our children from birth to graduation and all five of our children are homeschooling their children. We are all members of a non-denominational church. My husband and I see all too often that children today, Christian or not, homeschooled or not, have no respect for adults. In fact, I’m not sure they even know what respect really is. If you’re telling your grandchildren to stay away from the shed because a bee’s nest is there and a 6 year old states that “it’s a bee hive” then it’s a lack of respect. It happens often. The children view themselves on the same level as adults and that leads to not accepting the adults authority. Even as I state that it’s a problem I’m glad they’re not being raised in fear of their parents as we were. I don’t know what the answer is but I believe that the young parents talk to the children like equals. They share too much information and explain too much. No should mean no and the adult shouldn’t have to explain the reason especially when the child already knows and just tries to put their opinions in to possibly change the results. I don’t believe that children should be seen and not heard but there is a definite respect problem in today’s society. Sara Wert….I like how you think! I am raising my 5 children and homeschool them.We are teaching our children to respect adults.The problem is no longer children having ‘rights’ or being heard,but being respectful.We went to a birthday party and the children were allowed to walk across the table to get another piece of pizza! I was floored.Children who learn delayed gratification,as in speaking when they want, are the ones that excel most and people respect them the most.By learning to listen and be still,they hear wisdom and in time,they speak wisdom very well.